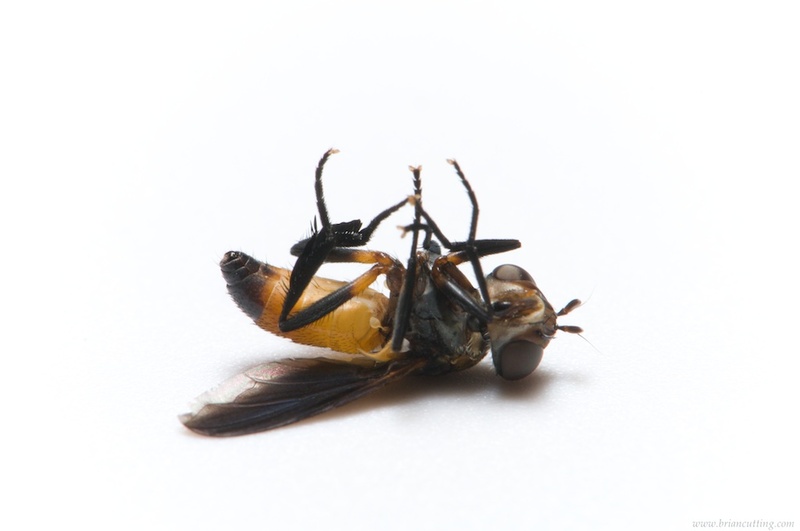 Trichopoda pennipes is a parasitic fly that attacks true bugs, and is the particular dipteran responsible for 'death by maggot'. In addition to devouring leaf-footed bugs from the inside, this Halloween-colored insect also attacks stink bugs, and has been used as a biological control agent for some species in Europe. For some time now I've been wanting to get a picture of these 'feather-legged flies' laying eggs on stink bugs, and so was delighted to catch a mating pair this afternoon. Unfortunately, Trichopoda like many insects exhibits a behavior that entomologists call "positive phototaxis." This is the same behavior that draws a moth to a flame, or as it were, a pair of flies to a 300-watt halogen floor lamp. As soon as I opened the container both flies spiraled upward with Icarus-like disregard, achieving results comparable to the myth. Alas, rather than the oviposition action shot I had hoped for, we are left with this photo of another upside-down insect. Her mate, I am afraid, fared even worse and could not be salvaged at all. Consequently, it smells of charbroiled death in here, and I am inspired to retire for the evening. Louis the lizard, a companion of mine for 14 years, helps out with some computer work. 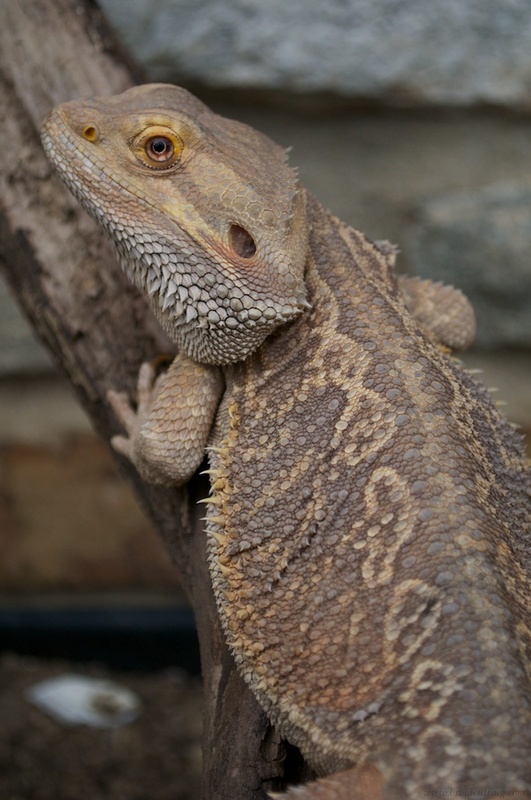 My pet bearded dragon Louis died today. We had been watching each other grow for half of my lifetime. When I first met Louis he could curl up with everything from his head to his tail in the palm of my hand - not that he was likely to stay there; he was a feisty little guy. I still remember the day when he darted off my hand and ran under a bookshelf. After removing all the books from the shelf to retrieve my pet, I vowed to keep a better watch on him. Louis munched on kale and crickets and grew quickly to nearly 2 feet. He watched me graduate from high school (and eventually graduate again, and again). He waited patiently during a period when I became more interested in girls than in him, I think knowing all the while that I would soon discover that he was something of a chick magnet. Louis may have helped me woo my herpetologically inclined wife, and he adjusted easily to sharing me with her when we all became one family. My bearded dragon Louis watches me grow my first beard, perhaps with some amusement. As Louis grew older he still enjoyed plodding around our home, but became increasingly fond of finding bizarre places to take a nap. On several occasions we found him snoozing with his head stuffed into a shoe. Ahhh, doesn't get much more comfortable than this does it? Even in old age, Louis would be jolted back into his youth by the sight of a dandelion flower, or by a bath in an overturned frisbee filled with warm water. Even when he could no longer catch crickets (or even immobile vegetable food) he could still spot a dandelion from across the room. Louis was more than a pet - he was a patient ambassador to countless people, both kids and adults who had never met a reptile up close before. While sometimes daunting at first, this gentle reptile waited while humans mustered the courage to feel the texture of his rough back, hard head, smooth belly, or spiky yet yielding beard. His beautiful soft eyes even won quite a few hearts from fear over the years, and encouraged people to engage nature in new ways. Louis has a snooze in his favorite cave, which Kiri and I built as a 'date' in our early days. Want to bring all the splendor of a summer meadow into your bedroom? Well apparently you can with the new...GADZOOKS THOSE ARE HUGE! 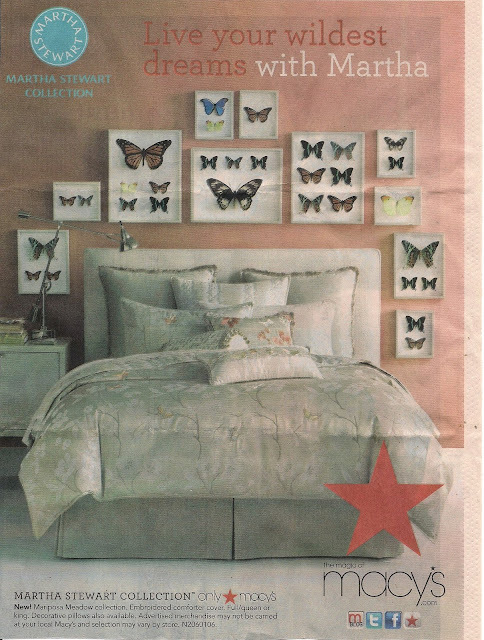 I doubt very much that Martha consulted her entomologist before publishing this advertisement. Not only do mutated butterflies adorn the wall, but also multiple size variants of what looks like Urania ripheus - a cool day flying moth from Madagascar. The scene recalls to mind the classic tabloid headline: "Farmer shoots 6-ft. butterfly!" Thanks to my grandmother for thoughtfully putting this advert aside for me!